Weak and embarrassing. But some will defend it, lol. Easy pass, and yet another nail in the coffin! Seems like they should be lowering that coffin now. Yeah and its not even projected to be all that good to be honest with you. I know personally when Metro, Far Cry, and Anthem came out I withdrew for a little bit(about a month and some change) and those games still were not all that good. The Division 2 is marginally better than Division 1 so I'm pretty sure it definitely will pull some players from RDO at least for a month or so.....and you know whats sad about it....for right now at any time R* has the ability to add good content to keep the players attention instead of gimmicky content, but that is not happening right now. Danube outfit has black / turquoise colours for skirt that cannot be bought individually in catalogue. Only way to get it, is to buy the whole outfit. Spoils of war feel similar to team shootout, even though it's not. Just 8 vs 8, two big teams. I only played one map though. I knew GTA:O showed R* they can take the piss out of gamers, but didn't expect it to get this petty this early. And if people eat this sh*t up, their next GTA:O really will get the shaft too. I'm amazed they're looking to fleece players so quickly and blatantly. The game is starved as it is, but to need to buy limited stuff already to grow the game along the way for ourselves is absurd. Inb4 others say we don't have to buy anything. Of course not. But it really is indefensible at this early stage. Seems like there's bonus XP for Showdown modes this week. Ahhh good. They were already the least effective means of obtaining Cash, XP and Gold. Nice to see them getting a buff. PvP modes i.e Showdowns is not griefing. In fact, it could be argued that people have been complaining about PvP elements to the daily challenges and by adding X2 RP to Showdowns will actually encourage players to take part and complete daily challenges in these modes. Maybe a habit that will stick. The kill players on horseback challenge as an example; piss easy to do in freeroam as we all have horses and you can kill unexpecting players, but it's much more fun grabbing a horse in Hostile Territory and killing players who expect you to kill them. If you're going to bother doing a "challenge", may as well make it challenging. Did you like it or was it a meh experience? It was okay. Paid like $15.00 to $20.00. 150 XP to 200 XP, excluding the 22 kills I got. But doesn't pay as much as Showdown Series Large. If that's true they better be upgrading the photo mode/camera cause right now it's trash and useless for taking creative/action pictures. Anyone know if the Winter Shotgun Coat is suitable for cold weather? The new spoils of war is pretty funny! Buying all ammo included dynamites also i didnt know that, had some epic moments where i throwed dynamites in the beginning of the game lol, also kinda fun to try to escape with the bag, i like PvP modes like this, two big teams that meet at the middle, real wild western lol, i dont belive we would get more fun then this in the beta, going to grind it and it’s also 2xp so now it’s the time to rank up and unlock some better bullets..
Is this mode a part of the showdown series? 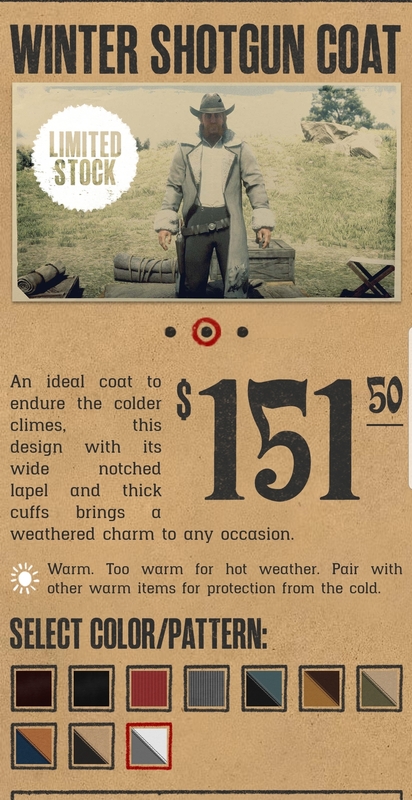 I would like to be availible to join just this mode in the future too, now it’s just to quick join it and you will only participate in this new mode, or visit the rs logo on the map..
You get differing levels of protection depending on the lining of the coat according to the online catalogue. Slightly Warm, Reasonably Warm and Warm. 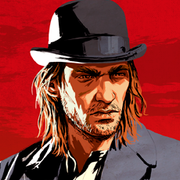 If you had read what i put i didnt say showdown was greifing I said daily's was causing greifing QUOTE "as well as pvp in daily's"
I have no issues with folk doing showdown pvp as that is the place for it but when R* but a blip system in free roam to curb greifing then add loads of Daily's telling players to go kill other players with x y or z gun that in my mind is promoting greifing in free roam Hence my other comment QUOTE "They deffo want pvp as there goal"
Well that's not confusing at all. 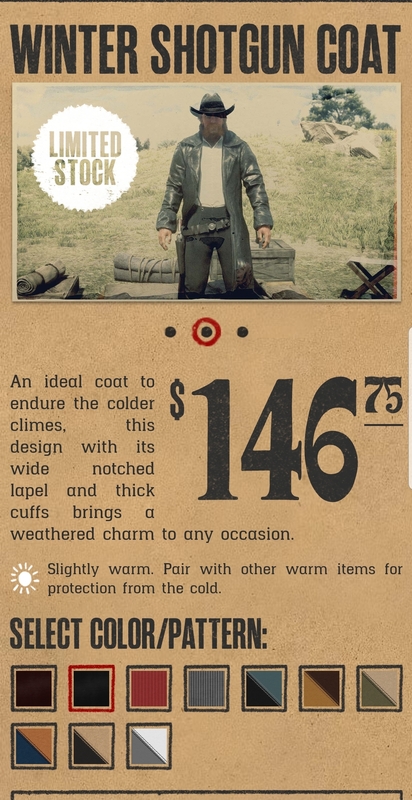 Be great if this info was displayed in game before purchasing it. Think I'll wait for the Porter Jacket. some of those have fur so hopefully they'll be suited to cold weather. Sorry, I can't see evidence that they are actively encouraging PvP in Freeroam, much less it being their goal. The changes to the blip and radar system was an attempt to prevent it and for the most part successfully so. AFAIK all PvP elements of Daily Challenges released so far can be completed in Showdowns and double XP on Showdowns shows that R* is trying to encourage the mode and get more players taking part. We can have different interpretations of course. It is confusing, afaik the only place to find that information is in the Social Club catalogue. The Porter Jacket variants with fur lining are reasonably warm, all the rest have the standard slightly warm protection. You know what? This is actually a good way of allowing people to wear what they want without worrying about core-drain effects. It's good information, there's no doubt about that. It means you can be more flexible putting outfits together for different conditions. What isn't so good, is that the information isn't, afaik, displayed anywhere in game. I'm always checking the social club catalogue before purchases and when putting outfits together. We are very sorry to hear that you are disappointed with the new in-game updated feature. As of now, this is as a part of gameplay design. However, we would definitely redirect you to the right department so that they will be able to review your feedback. Like I said, that can be done in Showdowns and is actually more fun and challenging. This is the first wave of limited-stock clothing ? or there were some limited clothing before ? You know, when GTA was on Tuesday they we're punctual with the newswire, 10 am. Ever since they switched the Thursday the newswire posting is slap-dash.